The California Fair Housing Act of 1963, better known as the Rumford Act (AB 1240) because of its sponsor, Assemblyman William Byron Rumford, was one of the most significant and sweeping laws protecting the rights of blacks and other people of color to purchase housing without being subjected to discrimination during the post-World War II period. It was enacted in in response to weaknesses in earlier fair housing legislation in California; and evolved from a larger civil rights struggle that emerged over the movement to create a permanent Fair Employment Practices Commission (FEPC) at the state level between 1946 and 1959. 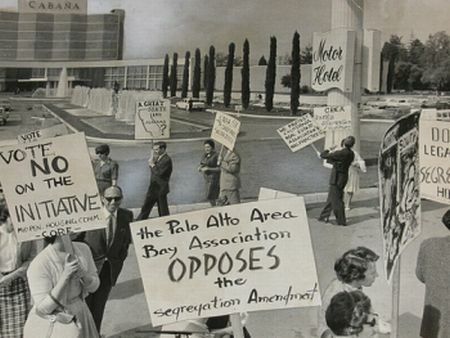 In California, activists called for a fair housing law stronger than measures passed in 1959 and 1960. The California campaign paralleled similar movements in Washington, Michigan, and Ohio. The Rumford Act called for an end to racial discrimination in all public and private housing in the state and immediately met opposition in the California legislature. Republican legislators exempted most forms of private and single family housing before the bill was finally passed on September 20, 1963. The new law made illegal discrimination in public housing and in all residential properties with more than five units. Despite the exclusion of the vast majority of the homes occupied by Californians, the California Real Estate Association (CREA) immediately launched a repeal campaign. Exploiting the growing hostility toward all liberal social programs and promoting the call for “property owner rights,” the CREA-led effort resulted in the Proposition 14 referendum on November 3, 1964, which saw a 2-to-1 vote in favor of repeal of the Rumford Act. Despite the vote, the Rumford Act was restored in 1966 when the California Supreme Court ruled that Proposition 14 was illegal. A year later, the U.S. Supreme Court strengthened this ruling stating that Proposition 14 violated the 14th Amendment and the Civil Rights Act of 1866, which “prohibits all racial discrimination in the sale or rental of property.” Before the battle over fair housing in California heated for another round, the U.S. Congress, in 1968, enacted the National Housing Act, which specifically prohibited housing discrimination by race, color, creed, and national origin. Joyce Henderson, William Byron Rumford: Legislator for Fair Employment, Fair Housing, and Public Health (Berkeley: The Regents of the University of California, 1973); Herbert Ruffin, Uninvited Neighbors: Black Life and the Racial Quest for Freedom in the Santa Clara Valley, 1777-1968 (Ann Arbor, MI: UMI Dissertation Publishing, 2007); and Robert O. Self, American Babylon: Race and the Struggle for Postwar Oakland (Princeton, NJ: Princeton University Press, 2003). NJ: Princeton University Press, 2003).